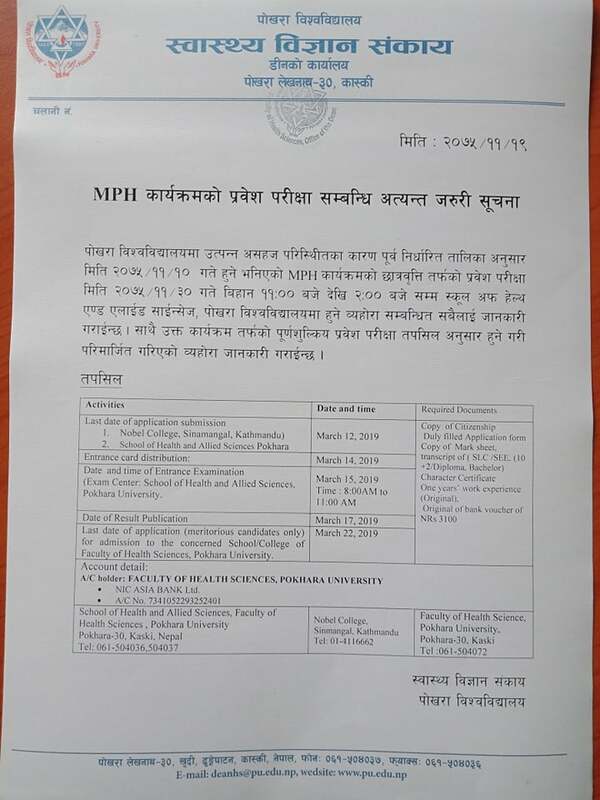 Pokhara University, School of Health and Allied Sciences notified about the scholarship entrance exam date of Master of Public Health (MPH). The entrance exam that was supposed to be held on Falgun 30, 2075 is going to be held on Chaitra 03, 2075 from 11:00 PM to 2:00 PM at School of Health and Allied Sciences, Pokhara University. 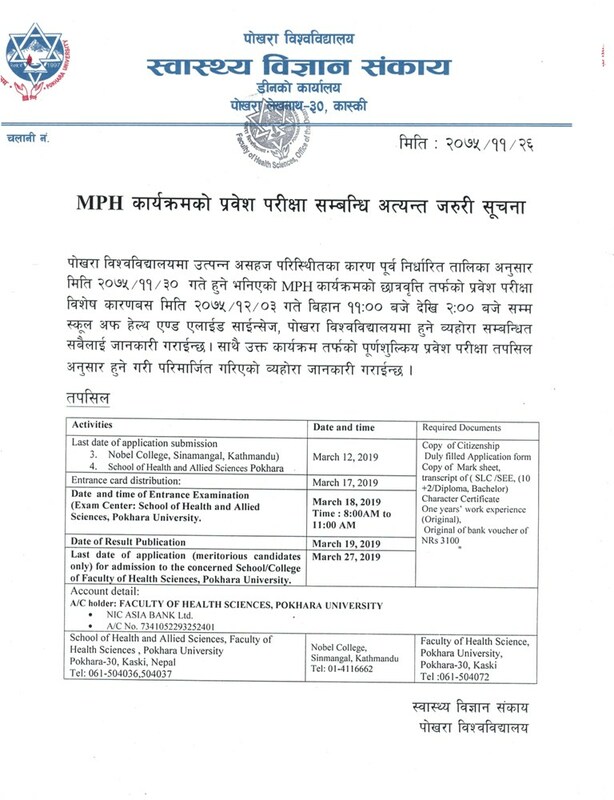 Pokhara University, School of Health and Allied Sciences notified about the scholarship entrance exam date of Master of Public Health (MPH). The entrance exam that was supposed to be held on Falgun 10, 2075 is going to be held on Falgun 30, 2075. Pokhara University, Faculty of Health Sciences, School of Health and Allied Sciences announces admissions for Master of Public Health (MPH) programs 2075 BS for Scholarships as well as Paying Quota. Currently there are two specialization, Health Promotion Education & Health Service Management. Total quota for the enrollment in paying quota has 39 seats and 6 scholarship seats. Those candidates who apply for both the Paying and scholarship quaot need to submit separate form and fees. Self-attested copies of academic documents (mark sheet/transcript, character certificate) for SLC and above, along with migration certificate, council certificate and citizenship certificate. Candidates who fail to submit all the documents by the deadline will not be allowed to attend entrance examination. Applicant must bring the original copies of academic documents while submitting the application form for verification. Applicant should pay NRs. 100 (nonrefundable) for application form. Applicant should pay NRs. 3000 (nonrefundable) as an entrance examination fee while submitting the application form. Current Account Number – 7341052293252401 NIC ASIA BANK Ltd. There will be 150 multiple choice questions based on the syllabus mentioned above. Evaluation will be based solely on entrance scores. If entrance score coincides, percentage score of highest academic qualification (Bachelor or equivalent) will be taken into account; if coincides still occurs, the score of highest academic qualification at lower (Intermediate or equivalent) and thereafter of SLC or equivalent will be considered. The selection criteria of students will be on the basis of merit. Admission committee will bear the sole responsibility if any controversies.